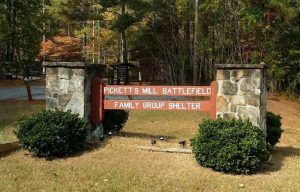 Please note that the event is NOT being held at Pickett’s Mill Battlefield Park. It is being held at the Family Group Shelter, which is off Hiram Acworth Hwy. Please use the address provided or one of the below links. From Atlanta: On I-75 Northbound, take Exit 263. Keep right, follow signs for GA-120 Loop W/Marietta/Southern Poly and merge onto South Marietta Pkwy SE – 3.1 miles. Turn right onto Powder Springs St/South Marietta Pkwy SW – 0.4 miles. Turn left onto GA-120 W/Whitlock Ave NW – 11.8 miles. Turn right onto GA-92 N – 4.5 miles. Destination will be on the left. Google Maps Directions – This link brings you exactly to the park entrance. MapQuest Directions – Using the actual address in MapQuest brings you too far South on Hiram Acworth Hwy, so this link brings you almost directly to the entrance of the park. Google Map – List of Hotels – If coming to site via I-75, either North from Chattanooga area or South from Atlanta area. Google Maps – List of Hotels – If coming from Southern suburbs via 278.